The History Channel® and American Association of State and Local Historians (AASLH) honor Acadian Museum of Erath, Louisiana, with $3,500 grant for outstanding preservation work in the wake of Hurricane Rita. The History Channel and American Association of State and Local Historians (AASLH) are pleased to announce that the Acadian Museum of Erath, Louisiana has been chosen to receive a $3,500 grant to recognize the museum’s outstanding preservation work in the wake of Hurricane Rita. The grant will help contribute to further restoration of the museum and help to rebuild its collections after the museum was flooded with over two feet of storm water in 2005. A&E Television Networks began a two- phased outreach program as part of a long-term commitment to help rebuild the devastated Gulf Coast after the hurricanes hit in 2005. AETN identified and adopted several schools in the hurricane devastated area, providing grants of $20,000 in goods, services, and financial support in 2005. The History Channel also contributed financial support to the relief effort organized by the American Association of State and Local History for its History Emergency Assistance Recovery Team (HEART), which quickly dispatched museum professionals to Louisiana and Mississippi. These mobile unit teams assessed the damage incurred by local museums throughout the affected areas and helped strategize for their immediate future. In conjunction with A&E’s Lives That Make a Difference and The History Channel’s Save Our History campaigns, the outreach effort now continues with phase two by honoring two small museums with grants as they continue the long process of recovery from hurricane damage—the Acadian Museum in Erath, Louisiana, and the Maritime & Seafood Industry Museum in Biloxi, Mississippi. The History Channel will recognize the first museum at a benefit honoring an exhibit and book dedicated to the Marquis de Lafayette on March 16th. The museum is located in the heart of Cajun country in Erath, Louisiana, and commemorates the Acadian heritage and Cajun people of Louisiana. The book, by Warren A. Perrin, is the first biography of an Acadian exile and tells the story of how he obtained a successful resolution of his Petition for an apology from the Queen of England for the Acadian deportation. All proceeds from the book’s sales are donated to the Acadian Museum. “The work of the Acadian Museum is a stellar example of how a dedicated staff, volunteers, and active community members can work together to help save the valuable documents and artifacts our local museums hold. The History Channel is delighted to be able to honor the Acadian Museum. We hope this grant will draw attention to the on-going need to support museums and history organizations in hurricane-affected areas as they continue to rebuild,” said Dr. Libby O’Connell, Chief Historian and SVP, Corporate Outreach for The History Channel. “For over 60 years AASLH has worked on behalf of the field of state and local history. We are honored to have partners such as The History Channel, and humbled at the history presented by grassroots organizations such as the Acadian Museum. Most history museums in America have the same challenges as the Acadian Museum—small budgets and even smaller staffs. But there is nothing small about their spirit and the recovery work done by the Acadian Museum stands as witness to the important role it plays within its community,” said Terry Davis, President & CEO of AASLH. Mr. Perrin has been honored with multiple awards for his devotion to preserving the heritage of the Acadian community, including winning an Award of Merit in AASLH’s national awards program. 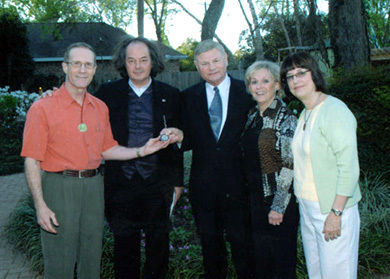 Mr. Perrin has drawn worldwide attention to the history of Acadian people, appearing on numerous television programs and featured in print publications in the United States and abroad. 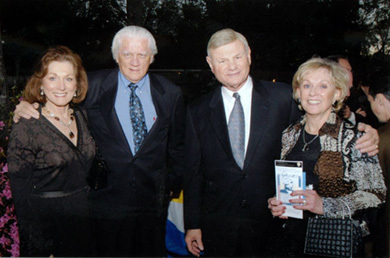 In September, 2006, he represented Louisiana and the United States at the World Francophone Summit in Bucarest, Romania. 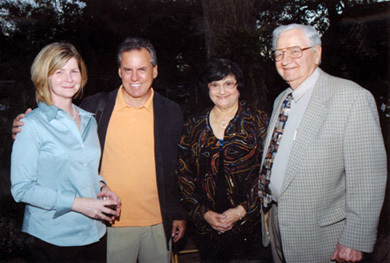 Perrin has a Juris Doctorate degree from Louisiana State University School of Law, and is an attorney with the firm of Perrin, Landry, deLaunay, Dartez & Ouellet, President of CODOFIL (the Council for the Development of French in Louisiana), and an Adjunct Professor at the University of Louisiana at Lafayette. He was a member of the board of directors of the Congrès Mondial Acadien - Louisiane 1999 and President of the Lt. Governor’s Task Force of FrancoFête ‘99. He is the author of Acadian Redemption: From Beausoleil Broussard to the Queen’s Royal Proclamation. 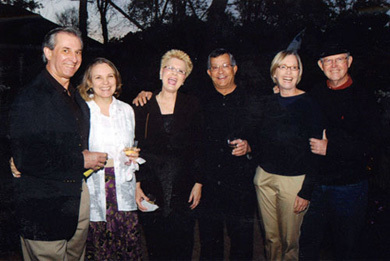 Judge Durwood and Rusti Conque, Kay and Larry Hebert, Mag Maraist and Clint Adcock. The History Channel® is one of the leading cable television networks featuring compelling original, non-fiction specials and series that bring history to life in a powerful and entertaining manner across multiple platforms. The network provides an inviting place where people experience history in new and exciting ways enabling them to connect their lives today to the great lives and events of the past that provide a blueprint for the future. The History Channel has earned four Peabody Awards, three Primetime Emmy® Awards, ten News & Documentary Emmy® Awards and received the prestigious Governor's Award from the Academy of Television Arts & Sciences for the network's Save Our History® campaign dedicated to historic preservation and history education. The History Channel reaches more than 91 million Nielsen subscribers. The website is located at www.History.com.